www.vintagefashionlibrary.com: The other mourning color. Norman Hartnell had a long history of designing for the British royal family, and for good reason - his designs were beautiful. He had a few bumps along the way, though, like the time he had a dress completed for Queen Elizabeth, the Queen Mother, only to have it remain unworn because King George VI's ire was raised when the press printed the description before it was actually seen in public. No more challenging situation was faced by Mr. Hartnell than in 1938, when the king and queen were scheduled for a state visit to Paris. The designs were completed, the garments in production, when suddenly the queen's mother, the Countess of Strathmore, passed away three weeks before the trip. What to do, what to do. Though the trip was postponed, it couldn't be cancelled, but seeing the queen dressed in the black of deep mourning would not make for good press, and would bring a sad facade to the visit that the royal family didn't want to present. Meetings were held, at which Mr. Hartnell presented an option that I didn't know existed: white as a mourning color. I think that most of us, when thinking of mourning, think of black. Black crepe especially, but black satins as well, though today the black could be in almost any fabric. What I never realized, but thankfully Mr. Hartnell did, was that white was an alternate mourning color. Though purple was also a mourning color used by the royal family, they felt that for this trip, the queen would not stand out in the crowd enough in a purple frock. The royal family generally dressed in light colors when in crowds, as the throngs of spectators tended to dress in darker, day dress colors. Lighter colors stood out better, and what better light color than white? White also solved the problem of trying to complete a wardrobe in two weeks, because the fabrics would not have to be dyed, nor the buttons or trims and laces. Problem solved. And so it was that the queen appeared in this beautiful frock, complete with lacy parasol. 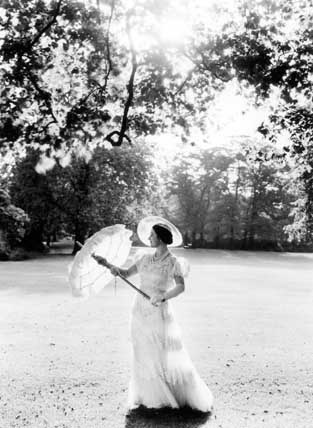 She was so endeared on this visit that she brought forth a resurgence of parasols simply by opening hers. Deep mourning? Yes. But sacrifice the royal image? No. What fun to learn about this. Thanks.